A few of life's greatest joys are beginning to collide to bring an even bigger smile to my face. Behr is full on walking. We may have skipped over this milestone a bit in blogland, but let me tell you, walking is happening! And then we have been experiencing pockets of gorgeous Spring-like weather. Sunshine is always welcomes, especially on the weekend. Beautiful weather + walking, adventurous toddler = sheer enjoyment! ...to lunge himself head first! Seconds later he turns around and tries to climb back UP the slide. Little man, you are just a wee bit too little to do that just yet. But someday, someday soon! Behr's First Solo Slide from Shannon Schreiber on Vimeo. I am linking up with morgan of moma loves papa for her one year anniversary of small style! psst. the sliding head first was completely unprompted! oh behr! always on the go. sounds exactly like jess. never a dull moment with these little ones!! He's so sweet! Ava was all about going up the slide too. Can't believe it's mild enough for you to take him to the park. Amazing! Behr is sooo cute! 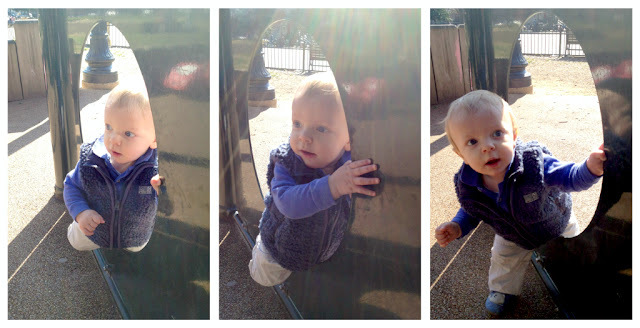 I loved watching him go down the slide all by himself! He did such a good job. You two are good parents! Oh goodness - that video! My mama heart thought he was going to spin and take his teeth out on the slide... eeep - good thing Daddy was there to catch him - and you ;o) Cuteness! Wow, congrats on the walking, B! And what a season to do it in. Springtime is perfect for finding your feet.